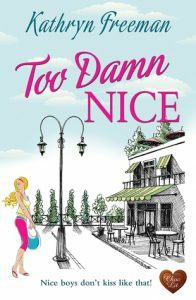 I have to admit that the “friends to lovers” plotline is not my favorite, but there was something fascinating in the synopsis of Too Damn Nice so I decided to give this story a try. Furthermore, the blurb seemed more like a good chick-lit than a romance novel and I wanted to read a chick-lit. I am glad that I decided to read this story even though it’s far, far away from being chick-lit. I can say that I got way more than I expected. Too Damn Nice is story about how two friends, who loved one another for a long time, finally get together. That is just a part of it. After they got together they broke up, only to find another way to true happiness. This is not a funny or a cheerful story but it’s truly not depressing either. On top of that are all the misunderstandings between Lizzie Donavue and Nick Templeton which push the story into sad territory. Lizzie and Nick are complex characters. They both have their own deep insecurities. Nick thinks that because he is a boring accountant, Lizzie does not care about him. While Lizzie thinks that because she did something wrong in the past, she does not deserve Nick. Sometimes they are so rude to one another. But, there are times when Nick does not act like such a darn nice guy, and Lizzie is not full of guilt. That’s really good because if the characters had stayed in their predefined roles the whole time, the story would not be so darned good. I refer especially to Nick’s character. If he’d been nice all the time it would have been just too much. I applaud the author. Kathryn Freeman did a wonderful job of keeping the story interesting and on a high emotional level the whole time. In the first part of the book she balances very well the subtle balance in Nick and Lizzie’s relationship. It’s a relationship in which both of them wanted to cross that line of friendship and enter the lover’s territory, but they just didn’t dare. Each time when they were on the verge of becoming a lovers another unexpected twist happened. Later on when the line is finally crossed, the author again did great work in focusing on their doubts and fears. By resolving them the path to their HEA was finally open. There are so many places in the story where the author could have fallen in the trap of cliche, but she successfully avoided it. So once again, I applaud the author. Too Damn Nice was my first hidden gem this year. This highly sensual and deeply emotional story was a great read. I am definitely putting Kathryn Freeman on my ‘to read list’. If you like contemporary romance featuring friends to lovers and opposite attracts, I highly recommend this story.